Tonido FileCloud competes as a private Dropbox alternative in the Enterprise File Sync and Share (EFSS) space. Both systems works across all the popular desktop OS’es (Windows, Mac and Linux) and mobile OS’es (iOS, Android, Blackberry and Windows Phone). Both systems offer all the basics expected out of EFSS: Unlimited File Versioning, Remote Wipe, Audit Logs and user management. When you use Dropbox for file sharing, your partners and customers go to Dropbox website to access the files while Tonido FileCloud provides the ability to brand your web UI, Terms of Service and email notifications. Why do you want to spend your hard earned money to promote Dropbox brand? You should be promoting your business and brand. When you use Dropbox, the application runs under Dropbox domain name. With Tonido FileCloud, the system runs under your domain name (https://files..com) . When the app runs under your domain it creates better brand awareness and professional perception. When you use Dropbox all your business data is stored in Dropbox servers and encrypted by the key owned by them. It poses risks of snooping and you probably don’t even know it has happened. You run FileCloud in your own servers and you have complete control over how it is accessed and who has access. When you use Dropbox, there is no data separation or isolation among customers data. All data is clubbed together, de-duplicated and stored in common infrastructure. Even a breach attempt in one place will affect all the customers. Dropbox for Business needs a 3rd party identity provider to integrate with your Active Directory authentication. FileCloud works out of the Box with Active Directory. Dropbox allows to sync only one designated folder across all your devices. While FileCloud provides not only sync but also Endpoint Backup and Network Share Sync. If you use Dropbox for Business first you need to upload all your company files from your file servers and then use it from Dropbox servers While FileCloud enables remote access and offline sync to your existing file shares. If your business already uses NTFS permissions to manage file access , you need to recreate the access permissions in Dropbox While FileCloud works with your existing NTFS permissions. Honoring existing NTFS permissions helps to manage the access permissions in one place and saves great deal of your system administrators time and effort. If you are a business from Europe or Canada and your files are subjected to data residency requirements, Dropbox for business will not help you there. It is not a problem with FileCloud since it is completely hosted by you. For 500 users, Dropbox for Business will cost you approximately 75,000$/year While Tonido FileCloud will cost you only 12,500$/Year.You save more than 60,000$ per year. It is not a small change. 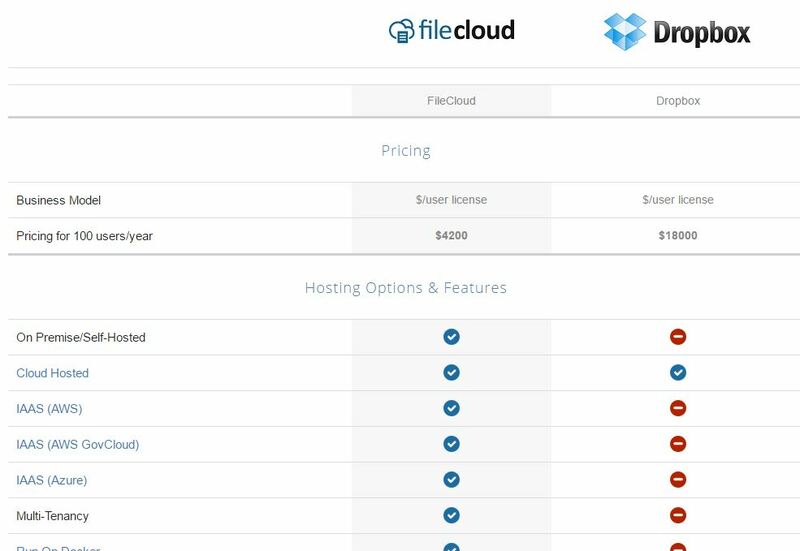 Compare FileCloud vs. Dropbox head to head. Learn why FileCloud is the leader among alternatives to dropbox!